Guest Bio: Dr Toby Fogg is the National Medical director for CareFlight. 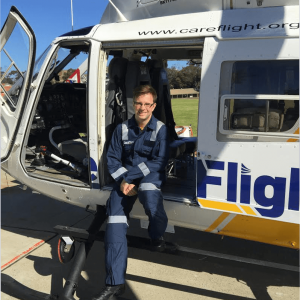 He started this role in June 2015, having worked for CareFlight as a specialist in Pre Hospital and Retrieval Medicine since 2009. He is also an Emergency Physician at the Royal North Shore Hospital – one of Sydney’s busiest trauma centres. Toby graduated from Southampton University Medical School in 1996 and left the UK to live in Australia in 2003. Segment overview: In today’s Health Supplier Segment, learn more about the brave men and women of Careflight. Our guest today is Dr. Toby Fogg, the Medical Director of Careflight which is an Australian aeromedical charity estalished in 1986. They use helicopter, airplanes and medi-jets to bring hospital level of care to the critically ill and injured. Their aircrew, medical teams and coordinators work closely together to ensure that patients receive the best care as soon as possible. They believe in bringing the right team to the right patient at the right time. Wayne Bucklar: You’re listening to Health Professional Radio with Wayne Bucklar. And today my guest joins me from Sydney, Australia. 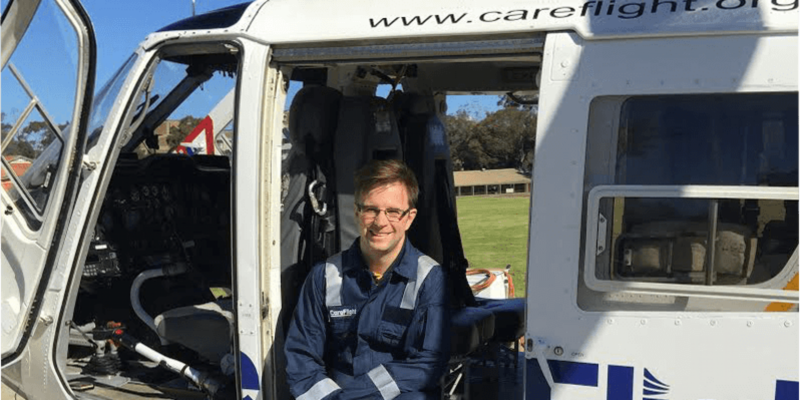 Doctor Toby Fogg is the Medical Director of CareFlight and CareFlight is one of those organizations that everyone knows a little bit about, but Toby is here to tell us maybe some more about it. Toby welcome to Health Professional Radio. Toby Fogg: Hello Wayne thanks very much for having me along today. W: It’s a pleasure to have you with us. Now as I said CareFlight is one of those things that brings to my mind helicopters and exciting news footage. Tell us more about what it is that CareFlight really does. And what’s your geographical footprint? T: CareFlight was established almost 30 years ago as a charitable organization designed to provide a rapid response critical care service. And we started off in Sydney and we soon indeed do have a rapid response helicopter here in the Sydney basin that services about 270 patients a year, we’ll fly off to and treat and we’re able to bring highly trained medical specialists and paramedic teams to those critically ill or injured. And in situations where seconds really count, the first is so well refined, we can be able within 3 or 4 minutes as per being tasked and then on scene in 10, 20 or 30 minutes of the actual injury. So we can really start the high level critical care treatments very early on after the injury occurs. And that’s as I say what we have been … for 20 minutes. But our efforts over the 30 years but we’ve also expanded our operation so we also now provide the aviation for the pediatric, new born, emergency counsel service … in New South Wales. So we have two helicopters there on standby to fly off to wherever they’re needed with the … clinical staff and they’re available 24 hours a day. And we also supply doctors to the ambulances in New South Wales to the Bankstown and Orange bases to again provide that critical care service to the great in New South Wales population. T: That’s very much our core business, but over the last few years we’ve developed a service in the Northern Territory as well and now we supply from the integrated service of medical coordination, aviation, engineers, and critical care and medical and nursing staff to the base of the top parts of the Northern territory. We’ve got five planes and a helicopter based in Darwin and go and we’ll treat and transport over 3000 patients a year, mostly bring them in the Royal Darwin Hospital. And that’s the full range of patients from premature babies, to unwell children and adult, as well as trauma victims from motor vehicle accidents in highly remote locations. And we also there have a search and rescue role and our helicopter can be tasked by the government to go searching for distress beacons for example off the coast or inland. And also we have a jet in Darwin that will fly patients down to seek specialist care in Adelaide or Perth or Sydney depending on their needs. And it’s quite a significant contract for a significant amount of work we do with the Melbourne territory government. W: Yes, it sounds like it. T: Yeah, it’s the rough scale, the distance, it’s quite staggering the size of the project over there. So very interesting medically to work there I have to say. W: My guest this morning is Dr. Toby Fogg. Toby is the Medical Director with CareFlight and he’s joined us here on Health Professional Radio to tell us about what CareFlight does. And we’re just been talking about the geographic footprint as well as the Northern territory. Toby do you service the mining industry too? T: Yes, thank you. We do indeed service the gas and mining industry. We have a several contracts with the operators. We’re able to provide high quality critical care both as in paramedics to support the workers in these very, very remote location. So one example I can give you is we have a contract with Inpex throughout developing the Ichthys gas. They stretch up about 220 kilometers off the shore of Western Australia in Timor Sea. And we have paramedics on some of the rigs out there and we have critical care doctors based in Truscott who are able to fly from a helicopter to patients on the rig. While they’re on route, paramedics will be provide them some initial care. We will then hand the patients to the doctors, we will then fly the patient back to Truscott and then we’ll bring back by one of our jets to then fly the patient on definitive care to Darwin or Perth depending on the nature of the problem. Our aim is to be able to deliver all that within 6 hours of the time of injury or the patient becoming unwell. It’s such an incredible feat in terms of logistics and coordination to be able to do that. So we feel we’re really really supporting well that the guys who are working in those remote conditions and sometimes quite dangerous environments. W: Yes, it sounds like it. And one of the things that I think has changed in medicine over the last 20 or 30 years is being that if you can get a patient and you get them stable then you have time to get them into critical care. T: That’s right. So what our aim isn’t so much all about rushing the patient to a hospital. We’re rushing sometimes definitive care out to that patient, we’re essentially taking critical care or emergency medicine care out there to where the patient is located and thereby saving sometimes many hours to start their definite treatment or at least provide a very high level of stabilization to there be an injury that needs to be surgically corrected. W: Now I understand Toby that CareFlight also has a major commitment to education and training. T: We certainly do. And it’s very much within our culture and so we’ve grown and evolved over the years and now we run many courses, really nationwide to help, support either the critical care, consultants, paramedics, nursing staff. We also have a real major project that involved in health and train up the rural and regional remote first responders, whether they are in effect … as clinical nurses or volunteers. And the courses are very much designed, how shall I say it, to train them how to look after the victims of say a motor vehicle accident, while the advance care is on the way in maybe for 10 minutes within some location but that can help could be 2 hours away. T: And the scale that we teach to these responders can really make a difference whether a life saved or disability prevented. They can do so much in the time that they’re there with the patient while help is coming. And to that effect what we have is essentially a mobile simulation lab and educators that will drive out to these communities. We we have a car roller that’s simulated that we can take with us so we can actually simulate patients trapped in a car and we can train the responders how they can help patients while they’re still trapped. So you know teach them how to do the extrication, but we can teach them an awful lot of things that they can do while the patient is being extricated from the car. And we feel this is really a valuable and over the 3 or 4 years that this has been running, we’ve trained over 1500 first responders in 63 locations across the country. W: Toby it’s been a pleasure chatting with you and we’re running out of time. But it does sound like CareFlight is much bigger and more complex than just the kind of image that I have of a helicopter and a doctor in Sydney. T: That’s right. We’ve certainly evolved and grown over the time and we continue to strive and deliver better services to more people through research and development and growth. W: Dr. Toby Fogg it’s been a pleasure having you with us today. If people want to get in touch with CareFlight, how can they do that? T: Thanks so much Wayne. Yes by all means if anyone wants to get hold of us, if you go to careflight.org you will find our website. The details, all the activities that we get up to and it has all our contact details there as well. W: If you just missed my conversation with Dr. Toby Fogg the Medical Director of CareFlight, then there’s good news and more good news. The good news is there’s a transcript of this interview on our website at www.hpr.fm There’s also an audio archive of our conversation both on YouTube and SoundCloud and there are links to that on our website. Toby thank you for your time, I realize you’re a busy man and I do appreciate your joining us today. W: You’re listening to Health Professional Radio. My name is Wayne Bucklar.